View, print, customize, save and email as many maps and photos as you want for one full year. 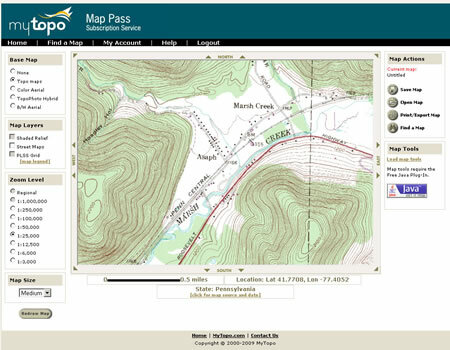 View topographic maps at five different scales simply by selecting a "zoom level" in the left margin of the screen. You can veiw at a regional 1:250,000 scale down to a highly detailed 1:12,500 scale. Navigating around the maps is easy. Just click any location within the field of view, and the map will recenter on the point that you clicked. Use the navigation arrows around the map window to move the field of view in that direction. With "Map Tools" loaded you will be able to "grab" the map and slide it around to change the field of view. While a member, you will be able to print as many maps and aerial photos as you want. Print the map area in your view (in landscape or portrait format) simply by clicking the "Print/Export" button in the right margin. Print/export also allows you to email maps, download .pdf map files, download 2000x2000 pixel high-resolution TIFF files, or download a low-resolution .jpg file of the map area. The maps in the service are scanned copies of USGS topographic maps. You will be able to view low-altitude, color aerial photos for all states except Alaska, Hawaii and New Mexico. You can also view and print perfectly matched map / aerial photo pairs. 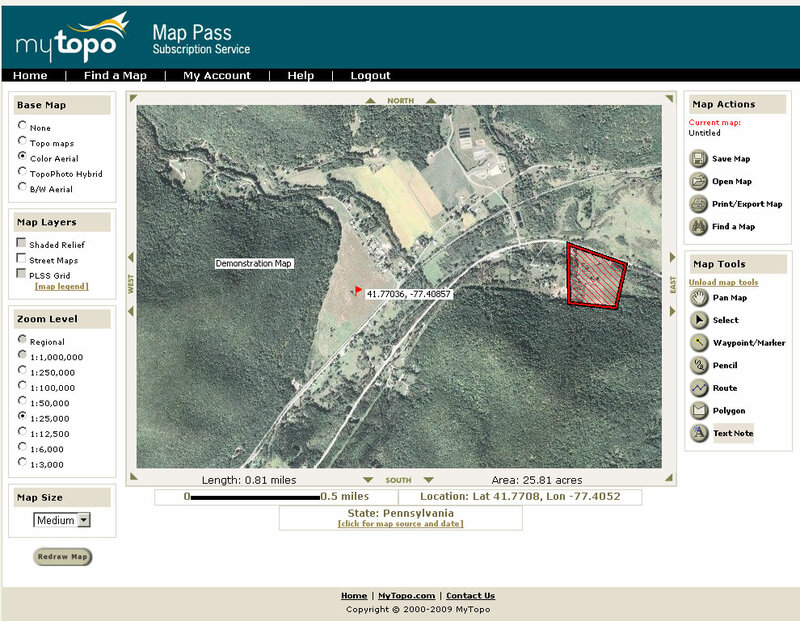 To change from topographic maps to aerial photos, simply click your viewing format in the "Base Map" window. The view will change from map to photo and remain fixed upon your location. Lots of topographic map users find that aerial photos instantly improve their navigation ability - photos have LOTS of information that is not shown on any map. Compile a personal library of maps and photos for all of the places that you work or enjoy the outdoors. To print a matched pair (aerial photo / topographic map) simply print the photo, then click "Topo Maps" in the Base Map setting box and print the map. How old are the photos and maps? You can find the revision date of a topo map or the photo date of an aerial by clicking on the "More about this map" link under the map window. This will report the photography date and map revision date for the center of the map window. Most aerial photos are 2009 or newer. Updated photos are added quarterly. You will also have access to black and white aerial photos. Aerial photography, precisely matched to the maps, is the most important advantage that MapPass offers over most mapping software. Why use aerial photos? If you use USGS topographic maps without aerial photographs then you are in the field with only 1/2 of the tools. How many times have you looked at a map and wished for more information? Photographs show vegetation, fence lines, roads, trails, structures and terrain features that do not appear on maps. 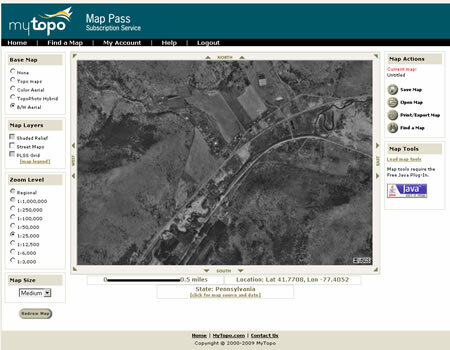 MapPass allows you to view color or black & white photos at seven different zoom levels - from a regional view at 1:5,000,000 down to a highly detailed 1:3,000. "TopoPhotos" are an extremely useful map option. They are color aerial photographs with the elevation lines and cultural data of a topographic map superimposed. They give you the most important features of a topographic map on top of an aerial photo. Many people who try TopoPhotos now use them instead of a topographic map. They give you the advantages of maps and aerial photos combined. You will have access to easy-to-use tools that enable you to customize your maps and photos. With the annotation tools, you can mark locations with a dot or a flag, draw lines around property boundaries, trace travel routes, add text and symbols. You can save these annotated maps for future use. This is an easy way to share the location of homes, buildings, hunting grounds and fishing spots with friends. Other tools allow you to estimate GPS coordinates, mark waypoints, estimate areas, measure distances, and email .pdf maps to friends. To get an estimated latitude and longitude just place your cursor above a location, and the latitude and longitude will be shown immediately below the map. 1) The aerial photographs are matched precisely to the maps. 2) It costs less than any software. 3) It is extremely easy to use - almost like there is nothing to learn. 4) A great tool for printing field-ready maps. If you trash them, just print again. 5) It is very easy to share maps with friends by email. 6) You can easily save your customized maps for future use - or email them to a friend. 7) You get access to the entire United States for one price. 8) Measurement tools give you quick estimates of lat/long, distance, area. 9) Nothing to install or update - the Map Pass team updates the software, the maps and the photos on their server. 10) You can log in to the service from any internet-connected computer anywhere. TERMS OF SALE: You will have immediate access to the service as soon as your purchase is completed. There are no postage and handling fees to pay on this transaction. Only $29.95 for all of the maps and aerial photographs that you want for one full year. Purchase your Map Pass today! The MapPass service is compatible with Windows computers from Windows 98 (second edition) to present. Mac users can use MapPass with the FireFox browser and have access to all of the viewing, printing and map export features. Internet access is required to use the service.